Invisible. Removeable. Comfortable aligners. This newest technology allows dentists to be able to straighten teeth quickly and without the need for metal brackets or wires. Using 3-D computer imaging technology, invisalign has succeeded in achieving quicker results than traditional braces because they move the teeth in accordance with a computer generated sequence. Invisalign clear braces are customized for a patient's teeth, allowing a more natural look and feel. 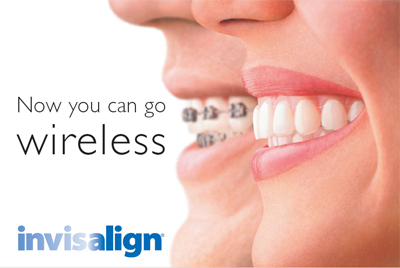 Invisalign corrects crowding, spacing and biting problems with great precision. Depending on your teeth and the length of time necessary to create beautifully aligned teeth, you will wear an aligner for two weeks. While you go about your day to day tasks, it is working to straighten your teeth. After two weeks, you put in the next mouthpiece which will continue to work at bringing your teeth into their proper position. The invisalign aligner is only taken out for eating, drinking, brushing and flossing. The number of Invisalign smiles grows daily, with more than 2,000,000 patients worldwide being treated. At your next appointment, Dr. Meade can help answer any questions you might have, and get you started on the smile you've always wanted. No. Thanks to the removable nature of the aligners, you can eat and drink whatever you want while in treatment. In fact, you're required to remove your aligners to eat and drink. So, unlike when undergoing traditional treatment using wires and brackets, there is no need to restrict your consumption of any of your favorite foods and snacks unless you are instructed otherwise by your doctor. Also, it is important that you brush your teeth after each meal and prior to reinserting your aligners to maintain fresh breath and proper hygiene. Remember that aligners are most effective when worn 20 to 22 hours per day and removed only for eating, brushing and flossing. The answer depends on how long you've gone without wearing them. If for a short period of time, the aligners should still be able to fit over your teeth. You might feel slight discomfort as your teeth readjust to the aligners. If the lapse in time is significant, please consult your Invisalign Provider. He or she will be best prepared to respond to your unique situation.